Let’s say you want to prevent a user with a certain name from being able to access your app pages. Application framework provides a centralized method of content retrieval, which makes possible creative ways of content production at runtime. 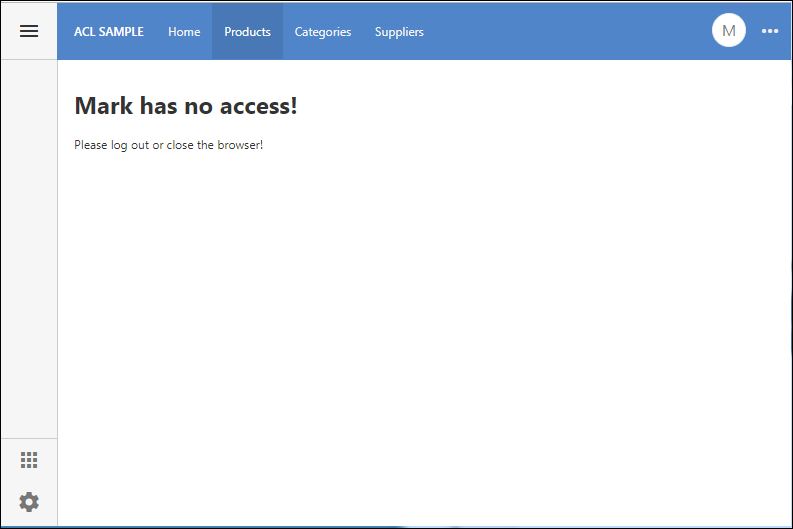 You can produce a custom output for the user with the name mark no matter what page he is trying to access. If the user with the name mark is logged in then he will be presented with the following message on any application page. 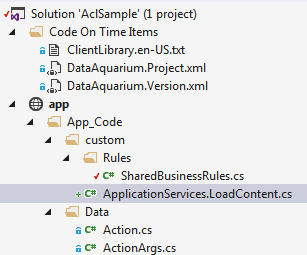 Create a code file in ~/custom folder of your app. Enter the following definition of partial class ApplicationServices. // Let the framework to load the file from the file system. // Typically the content will be retrieved from ~/app/pages folder. // The framework has located a physical file, let's check the user identity. // simulate the result of parsing by providing Title and Content of the page. An authenticated user with a name other than mark will see the application pages as defined at design time. 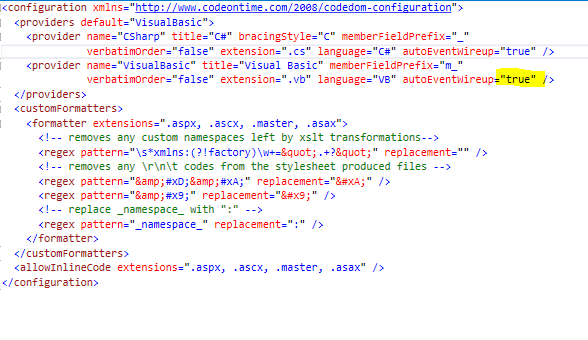 It appears that something has changed in ASP.NET configuration in the latest versions of Microsoft.NET. Visual Basic compiler used to perform automatic binding of *.aspx.vb methods to events of the lifecycle of the *.aspx page. It does not happen anymore. The custom code of the pages is not generated and only HTML markup is served to the clients. 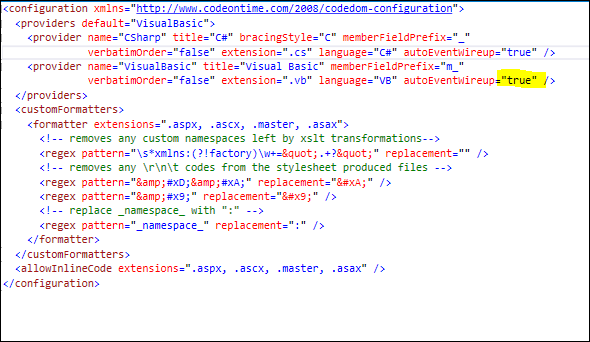 The code generator uses a setting in configuration file [Documents]\Code On Time\Library\_Config\CodeOnTime.CodeDom.xml to set up AutoEventWireup attribute in aspx pages. Save the file and re-generate your project. This will restore its normal operation. We are still investigating this issue. It is now possible to manually connect 1-to-1 entities in the model builder even when the foreign keys are not defined in the database. Legacy ASPX page implementation does not reveal static content in Touch UI. Unlimited Edition Trial now supports cultures other than en-US. (Classic UI) Bootstrap pages are correctly "sized" for "lg" screen with the expected container width of 970 pixels. (Classic UI) Fixed "match not defined" in _registerSpecialAction method of DataView. "Left join" to "inner join" optimization is now disabled when selecting data if “Quick Find” or “Is Null” filters are detected. (Touch UI) If a new lookup item is created in a from then the parent form in "edit" mode will not lose its selected key value. Fixed incorrect exception reporting from forms. Exceptions were not delivered to the client if there was no transaction on the server. Distinct requests to get values will override the model-defined Order By statement when creating a Group By expression. 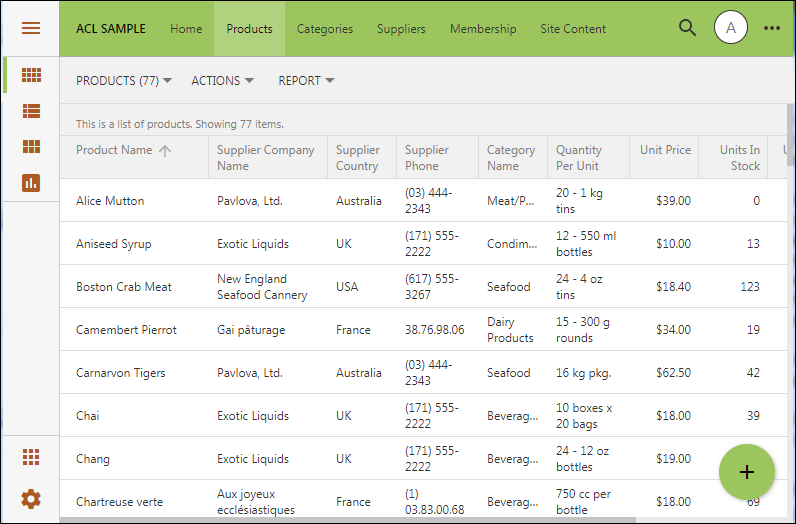 (Touch UI) Import process correctly starts after the mapping of fields has been completed. Fixed the error with view-level sort expression being ignored. 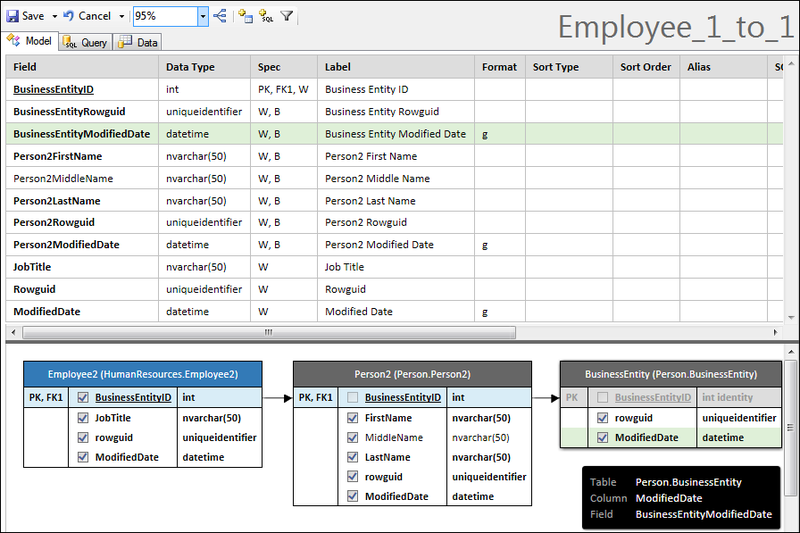 Fixed compilation issue in Standard edition apps caused by new Business Rule Builder available in Site Content. Model Builder has been enhanced in this release with additional support for 1-to-1 entities. Borrowed/inherited required columns are displayed as bold. The legend in the Spec displays both “W” and “B” letters signifying that the field is writeable and borrowed. If a developer is manually connecting primary key of one entity to another then the 1-to-1 relationship is established. This is a simplified model of HumanResources.Employee2 table from Adventure Works sample database. The table inherits columns from Person.Person2 and Person.BusinessEntity. 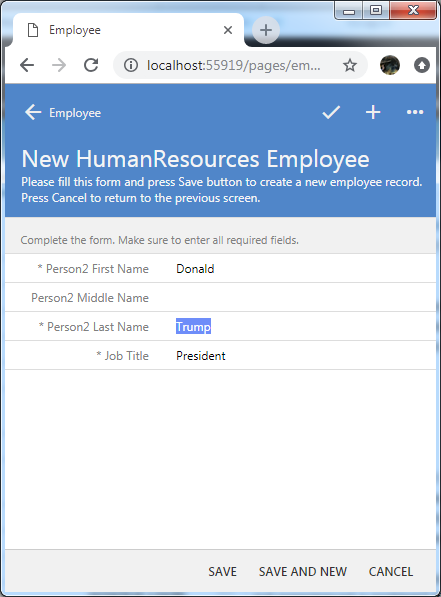 The form of Employee will display writable columns from all tables of the 1-to-1 relationship and persist them in a context of a transaction. Please note that “rowguid” and “ModifiedDate” columns were also marked as hidden in this sample.